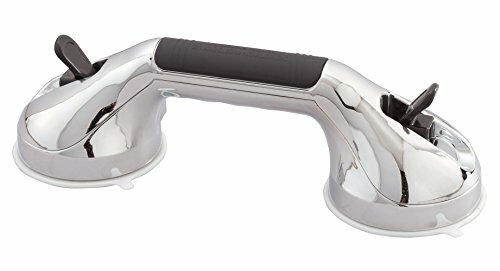 Miles Kimball Chrome Suction Grip Shower Grab Bars, Silver by Miles Kimball at Get Cheap Health Insurance. MPN: 0030351732. Hurry! Limited time offer. Offer valid only while supplies last. Chrome suction grip lends a helping hand in the bathroom. Secures to smooth tile, fiberglass and other surfaces to help prevent slips and falls. Chrome suction grip lends a helping hand in the bathroom. Secures to smooth tile, fiberglass and other surfaces to help prevent slips and falls. Simply place shower grab bar horizontally, vertically or diagonally and push lever to lock in place. Unique colorchanging indicators confirm proper suction: Green is safe, red means reattach. Tub grab bar releases with a flip for easy use anywhere. Stylish chrome design complements any decor. Installs instantly; no holes, screws or tools required. Fits most tubs and showers. Fits tiles 4" and larger free of grout lines. 11 1/2"L x 4 1/4"W x 4"D. For stability only; not intended to support full body weight.